New treatments for diabetes: Alternatives to insulin? Among diseases, diabetes is unique in its effects on the general health of the human being. It creeps silently, gradually causing complications that, if left untreated, can lead to complete deterioration of the body. Every year experts seek new ways of preventing the complications before they become inevitable, constantly highlighting the utmost importance of early detection. 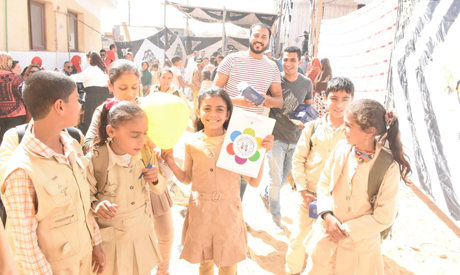 Through drawing workshops and illustrative plays, school children in Egypt's Fayoum this week learned more about protecting their health in an a light and fun atmosphere through the artistic diabetes awareness initiative simply called Kids. Kids was first launched in November 2017 with the aim to create a welcoming and supportive environment for school children with diabetes type one, as well as to raise awareness of prevention methods for type two. Since then, the initiative had branched out to to 12 schools in various Egyptian governorates, with the aim of supporting school children, staff and health personnel. Kids was launched by the Egyptian Association for Comprehensive Developments (EASD), Egyptian Society for Pediatric Diabetes (ESPED) and Sanofi, a private sector organization that aims to bring healthcare access to the underserved. The initiative is held under the auspices of the Egyptian Ministry of Health and Population, the Ministry of Education and the Ministry of Social Solidarity. Dr. Mona Salem, manager of ESPED, stressed that the campaign's target is to reach 6,000 students, 66 teachers and more than 8,000 parents. "Focusing on awareness throughout the school year is of the utmost importance, and involving participants in the seamless and convenient inclusion of diabetic children is pivotal," she said. Magdi Seydhom, deputy head of EASD, said that the training and art activities help students explore healthier choices of food, and teaches them the importance of constant measuring of glucose in the blood as a means of prevention. According to the WHO, the number of diabetics worldwide is 366 million. It is expected to reach 500 million by 2030. The prevalence of the disease among Egyptians is shockingly high, almost 17 percent. Egypt has the ninth highest prevalence of diabetes worldwide and is expected to be the eighth by the year 2030.